The next Mums talk will occur next Friday 14. It will be an introduction to the principles of universal algebra using categorical notions. In particular, we want to impress on the listener the importance of the notion of universal constructions in algebra. The beauty of universal algebra and category theory lies in their broad descriptive power, rather than in their depth. Abstract: An introduction to universal algebra using the language of category theory. Cats, functors, universal constructions; omega-algebras, free objects, varieties, and the isomorphism theorems. We end by describing some universal constructions with easy descriptions in varietal categories. Intended audience: It’s enough to know some basic algebra (which we use just as examples): group, normal subgroup, quotient group, ring, ideal, quotient ring. It would be nice to come in with the idea of categories in your head. This talk already occurred. Here is the writeup. Notes from the available upon request (send me an email). Abstract: An introduction to the modelling of computation, computability, connections to incompleteness in logic, time complexity of problems, completeness in the class NP, and a proof of the Cook-Levin theorem. We’ll end by discussing a modern approach to the famous P v. NP problem based in geometry if there’s time. The whole talk will be very elementary. This Thursday, Samer Seraj, and undergraduate student here at UofT, will be giving a talk on his original research in cryptographic security. In his talk titled “On Diffusion”, Samer will outline the ideas of his solution to an open problem in security posed to him in an undergraduate research course. Spanning more than one year of work, Samer prepares from his latest results, in conjunction with materials from his earlier talk in Normandy, the awaited conclusion to his research. Samer will finish his talk by proposing 3 open problems to the audience as directions for further research. 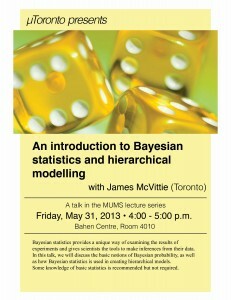 This talk is accessible to math students in all years of study at UofT. Abstract: We first precisely define the space and structure of cryptographic information. We then proceed to compare two rival definitions of diffusive (scrambling) functions between such spaces, and produce optimal versions of each. The interesting fact is that some use the two definitions interchangeably, but they are quite different. Finally, we propose new directions of research and open problems. The material is from a paper by the speaker, under the supervision of Dr. Kumar Murty. Hello! Welcome back to the new school year! Coming this Friday September 20th, we have a guest speaker, Mariya Boyko, a PhD student in History of Mathematics. The MUMs talk will be at 5-6pm in BA6183. Here is the abstract for the talk!! The 1950s and 1960s were marked by education reforms in US and USSR. Those changes to the curriculum originated in a desire to connect mathematics education at all levels to what was happening in “modern” research mathematics. The reforms were very fortunate to enjoy vastly increased financial resources that were devoted to science education because of concerns arising in the Cold War, the “space race”, “arms race” and general public unrest. We will discuss the mathematics curriculum reforms promoted by professor of mathematics A. Kolmogorov in its intellectual, political and social context, explore Kolmogorov’s pedagogical innovations and trace the development of his ideas to the present day mathematics curriculum in Russia and the USA. MUMs is proud to announce to host Mock CUMC!! This event is in the spirit of upcoming CUMC. Since not everyone can make it to CUMC for this year, the purpose of Mock CUMC is to have student speakers in CUMC from UofT to give a talk in the University of Toronto. Any Undergraduates in UofT are welcome! Talk topics and abstracts will be available soon. 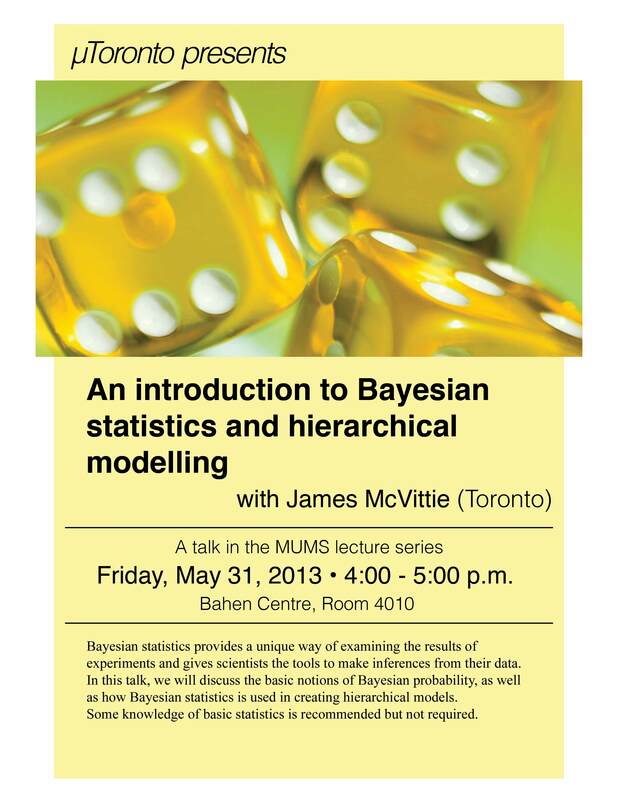 On Friday May 31st, James McVittie will present a MUMS talk on Bayesian statistics & hierarchical modelling in BA 4010 at 4:00 p.m. See the poster below for more information. MUMS is a series of math talks given by undergraduate students at the University of Toronto. Talk topics and styles vary significantly, but all interested students are encouraged to present. Organizers: Anne Dranovski, Matt Sourisseau. Structure: To present, please email the organizers with your full name, talk title, and a 2-3 paragraph abstract giving the mathematical layman an idea of what kinds of things you’ll be talking about, and where these things fit into other areas of math or science. You can now give your talk online in the form of a blog post. This can be in addition to a real life presentation or standalone. Of course, we would prefer both: if you are giving a talk, blog about it! and if you are “giving a blog”, talk about it! In case you choose to talk and not blog, we will elect a scribe who will be responsible for taking thorough notes on your talk, latexing them, and posting them here. MU’s website has finally launched, and the MUMS blog has come along for the ride. May they remain forever in orbit. You should also subscribe to the main RSS feed, by clicking posts in the top right corner. Check out the talks calendar for past and future MUMS talks.